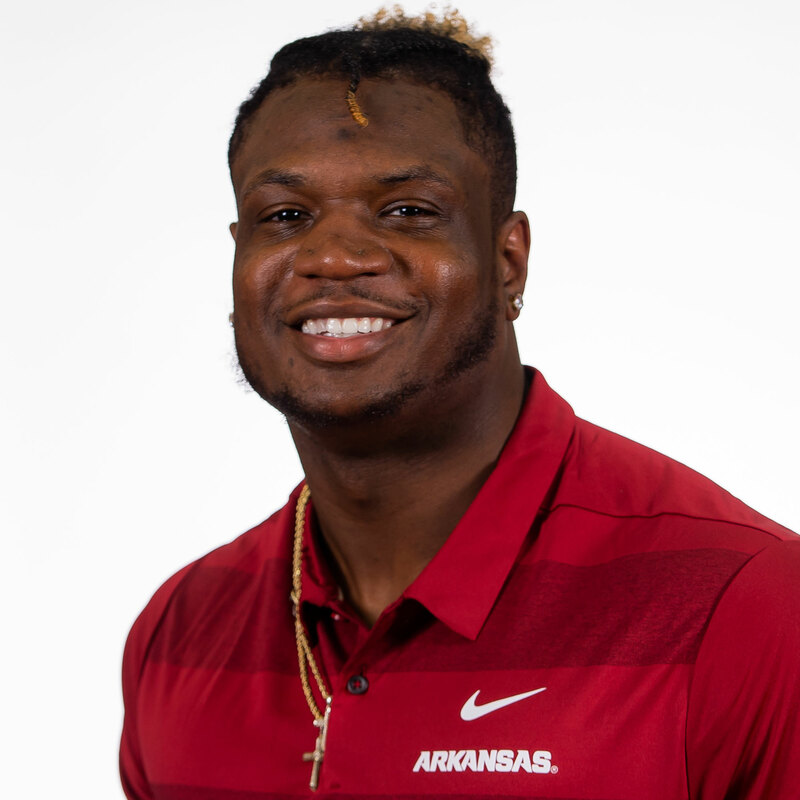 2018 (JUNIOR): Played in 11 of 12 games for the Razorbacks in 2018, starting each of the first two games at defensive end … Totaled 246 snaps over the course of his junior season, with 199 coming on the defensive line and 47 on special teams … Recorded 13 total tackles, three solo, including 1.5 tackles for loss (three yards) … Also was credited for two quarterback hurries, one pass breakup and a fumble recovery against North Texas on Sept. 15 … Earned TFLs in each of the first two games, with a half tackle for loss in the season opener as part of a four-stop performance vs. Eastern Illinois, as well as one TFL, three total tackles, at Colorado State a week later … Posted stops in four more games in 2018, securing multi-tackle performances in back-to-back games at Auburn (Sept. 22) and Texas A&M (Sept. 29) … Also made stops against LSU and Mississippi State … Put together five games of 70.0 tackling grades from PFF, ending the season with an overall mark of 70.3 in the category … Had a season-best overall defensive grade against Alabama with a 74.0 … Part of a defensive crew that racked up 882 total tackles over the course of the 2018 campaign. 2017 (SOPHOMORE): Saw action in four games … Played six defensive snaps and participated on special teams … Forced a fumble that was recovered 18 yards for a touchdown by Henre’ Toliver in the season opener against Florida A&M (Aug. 31). 2016 (JUNIOR COLLEGE) AT HUTCHINSON CC: Earned KJCCC All-Conference honorable mention status … Led the team with 18.5 tackles for loss … Tied for the team lead with 6.0 sacks … Totaled 60 tackles in 11 games to rank fifth on the team … 37 of his 60 tackles were of the solo variety … Part of a defense that allowed only 18.2 points per game and just 91.1 yards per game on the ground … 4.5 of his sacks came against conference opponents … Logged eight or more tackles five times … Tallied a season-high 13 stops, including 4.0 for loss, in a 21-12 win against Iowa Western CC … Recorded a tackle for loss in seven games, including five multiple tackle for loss performances … Racked up 10.5 tackles for loss through the last four games of the season … Notched eight tackles, a season-high 2.5 sacks and 4.0 tackles for loss against Independence CC … Coached by Rion Rhoades … Chose Arkansas over West Virginia, Louisville, Nebraska, Texas Tech, Syracuse, Maryland, and Buffalo. HIGH SCHOOL: Recorded 8.0 sacks as a senior and 9.0 sacks as a junior. PERSONAL: Born on Dec. 9, 1996 … Son of April Steele … Has five siblings: Travis Whitehead, Grace Whitehead, Faith Whitehead, Melvin Whitehead III and Jocelyn Richardson … Social work major with an emphasis in marriage and family counseling.